Hello Dice Masters! Welcome back for a special TOTM. Dice Masters North came to be on February 8, 2018. 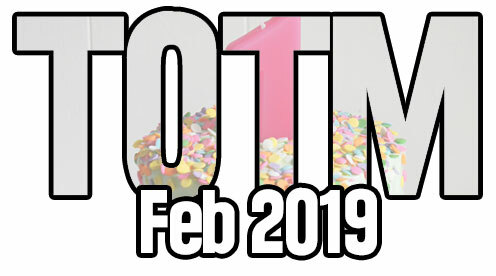 So, this TOTM is in celebration of the site’s Birthday. This competition will be open worldwide, and anyone is welcome to join. The submission deadline for this month will be 6:00 PM Mountain Time on February 23, 2019. Submissions should be filled out on the TOTM Team Submission Form. This is not a hard deadline, but the more notice I have, the better I can get things set up. This month, we are going to keep things fairly simple… for the most part. Your Team must be a Modern build. All cards banned by Wizkids cannot be used in this build. This seems a little too easy for one of our events, doesn’t it? Well, here is the only stipulation. Since a Birthday comes around once every 12 months, your Team will be built around the number 12. The total purchase cost of your Team must be a multiple of 12. Add up the cost of each die you include on your Team. If that number can be evenly divided by 12, you are good to go. No other restrictions. Wait… what? I thought we weren’t doing that this year? Well, this is kind of a special occasion, and I was able to get my hands on some goodies to share. I will let you spy on the details of those a little closer to the date. All I will say is that they are super. The plan is to play your Teams on Saturday, February 23, 2018, starting around 7:00 PM Mountain Time. We will be starting things off in our very own Hangouts Room. You can find the link here. Ideally, it would be nice to get 3-4 Rounds of Play in… but we will see what happens. Matches will be 30 minutes long to avoid slogs. If the game is tied when time is called, the game will go to 5 turns with the active player being Turn Andy (or Turn Zero if you want). The player with the most life at the end of Turns will be the winner. Looking forward to seeing you there. Thanks for reading and feel free to reach out to us with any questions. Posted in Dice Masters, GameplayTagged Team of the Month, TOTMcomment5 Comments on TOTM: Happy Birthday! 1. Can we use proxy cards/dice? 1. Proxies for dice are fine by me, as long as the dice match exactly (stats, energy, etc). Cards are fine as well. 2. Yes. That is fine as well. Team counts your own BAC costs as well? Do your own BAC count toward the total costs /12? Yes. BAC’s count in this total.